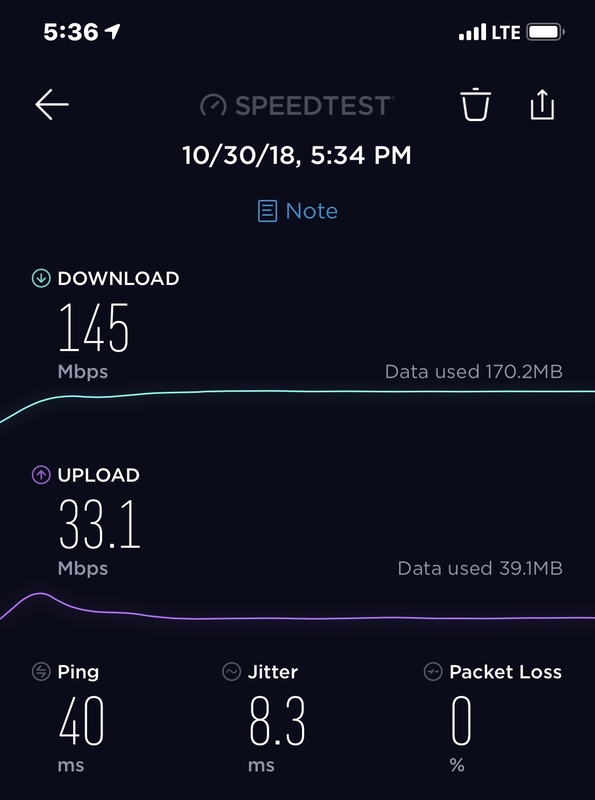 We don’t have AT&T Gigabit LTE yet but these LTE speeds are pretty fast on my XS Max. Very nice, I usually get about 13 at home on T-Mobile. I get between 25 and 60 in most places around town but at work I get over 100. There is a huge tower within eyeshot of the front door at work. I’m guessing it’s an AT&T blowtorch. I read that AT&T gigabit LTE is averaging over 400Mbps and can hit over 550 in spots. Last summer on TMobile with my X.
I scrubbed through my history and this was the best cellular download result I had. The area does have a huge tower and I was about 500 meters from the tower when tested. I need to go try my XS Max and Note 9 Exynos at this location to compare. C6TX6 and nikkisharif like this. That’s faaaast! I can’t wait for gigabit LTE and then eventually 5G. Almost everything we do on our fancy smartphones depends on our internet connection. If the connection is slow it doesn’t really matter if you have the fastest phone available. I do wish upload was a bit faster as I push all my photos and UHD/60 videos to our Dropbox enterprise bucket! The phone gets hot too! Wifi is faster and download/upload speeds are virtually the same. XS/XS Max wifi radio while "only" 2x2 AC, is still faster than previous generation if by a little but it helps! 4x4 would be incredible. (but I think it would make the battery cry!) Even my Macbook Pro is "only" 3x3 and hits gigabit speeds (fast.com). The access points are 4x4 wave2 and have either 2.5 or full 10Gpbs backhauls. I get like 51 Mbps download max and 13 Mbps upload max. But I'm in the middle of Minneapolis. That’s better than the national average. A little faster on 12.1 and without a case. I was back at Disney again yesterday. The first one was at Magic Kingdom in the middle of the park and the second was at Epcot from within the middle of the park. This is on Verizon. I am even over the de-pri threshold for my VZW Plan (22 GB) so no issues with congestion even at Disney. Most likely possible from the DAS they are on. 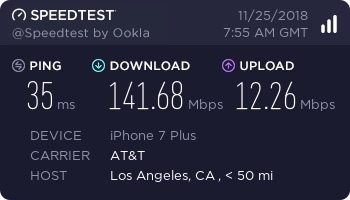 AT&T in Whittier, CA. 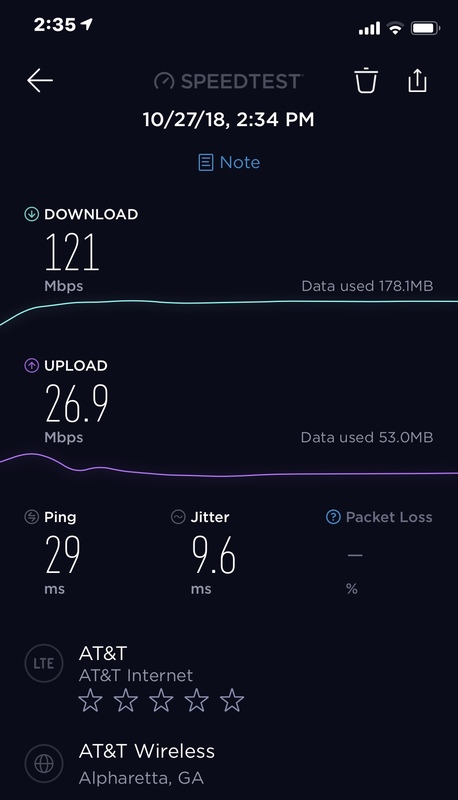 I’ve never had speeds this high. 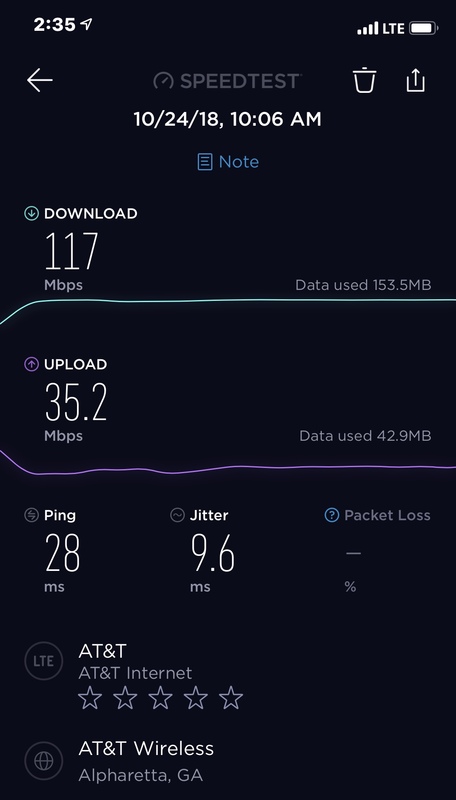 I consistently get far quicker upload speeds (140Mbps compared to 40) in particular on T-Mobile with my OnePlus 6T and my wife’s Galaxy S9 than I do on the XSMax. The bigger issue for me is that I commute to work on the subway which is above ground much of the time, and the hotspot strength and uptime is terrible on the XSMax compared to the OnePlus. Apple should do better than this. The speeds above are acceptable, but the time to catch a strong signal after a tunnel for example, is really not acceptable, particularly at this price. Not replacing the iPhone. It has too many other advantages, but still not thrilled with that. Sadly in my area the speeds on "LTE" are not awesome by any means. 5G will be interesting but will it be a real game changer and how will the carriers change data plans? They may use it to force everyone onto Unlimited plans with 5G.